When winter settles in, we begin to worry about our furry companions. We’re layering on coats, scarves, and warm snow boots, while many of our dogs brave the weather in naught but the coat nature gave them. Some dogs are better able to handle northern climates than others. Bigger dogs are generally better able to maintain body temperature in cold weather, while smaller dogs will lose a lot of energy trying to do so. Double-coated dogs, like Huskies, Samoyeds, and Malamutes, have a layer of soft, insulating fur under their guard hairs which insulate against extreme temperatures. Dark-furred dogs are better able to absorb warmth from the sun than white haired canines. Also consider the age of the dog – older and younger dogs are not as well equipped to handle the cold as adult dogs. 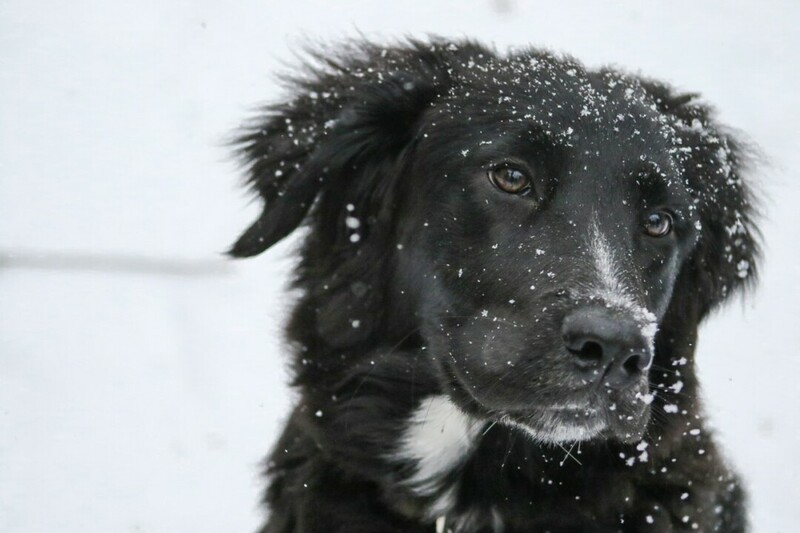 If you’re concerned with whether your pooch is safe outside for longer than it takes to do his business during the chilly months, here are some things to consider, courtesy of Dr. Jodi Bohl of Eau Claire Animal Hospital. A dog’s body needs time to adjust to cold temperatures, Dr. Bohl said. As the mercury drops and the daylight hours decrease throughout autumn, canines bodies respond with winter prep. They begin storing more calories, their skin gets thicker, and their coats grow thicker and denser. They even grow more hairs between their toes to keep their feet safe from frostbite. A dog that has had a chance to adapt to the season will have an easier time with the cold than one who travelled from a warmer climate. Dogs should have adequate access to food and water, and weather-appropriate shelter. In the summer, this means being able to get at the shade, but in the winter, it generally means access to a doghouse of some sort to protect against wind, precipitation, and cold. Dr. Bohl suggests shelters face south to take advantage of the low sun, and protect against north and west winds. Shelters should be insulated against the cold of the ground with styrofoam and straw.“Increasing their food intake is warranted especially with very active, winter breeds like sled dogs or hunting dogs,” Bohl said. Dogs burn about 20 percent more calories maintaining normal body temperature if they are outside the majority of the day. Dehydration is also a concern during dry winter months, so access to unfrozen water should be supplied. Dogs shiver when cold, just like humans do, Bohl said. But when an animal gets too cold, shivering will stop and the dog will become lethargic, lose appetite, or appear disoriented. When temperatures are below freezing, check up on your dog to make sure they are not exhibiting signs of hypothermia. If you’re unsure about your dog’s comfort, just err on the safe side and bring them inside for some snuggles.